22K Gold Antique Necklace Set is designed with Kasu/Gold coins embossed with Laxmi Jee sitting on a Lotus flower. 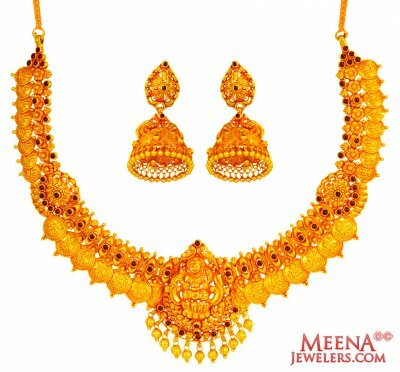 Excellent floral pattern and filigree work with studded ruby stones and hanging gold balls adds a traditional touch to it. Earring type: Jhumki earrings are designed with embossed Laxmi Jee and studded ruby stones with hanging Gold balls. Earrings have screw back post. Necklace is attached with a gold chain and is adjustable. Necklace is 16.5 inches long and the width of the patta is 23 mm. Hanging pendant 50 mm long and 40 mm width. Earrings are 48 mm long and 24 mm wide.